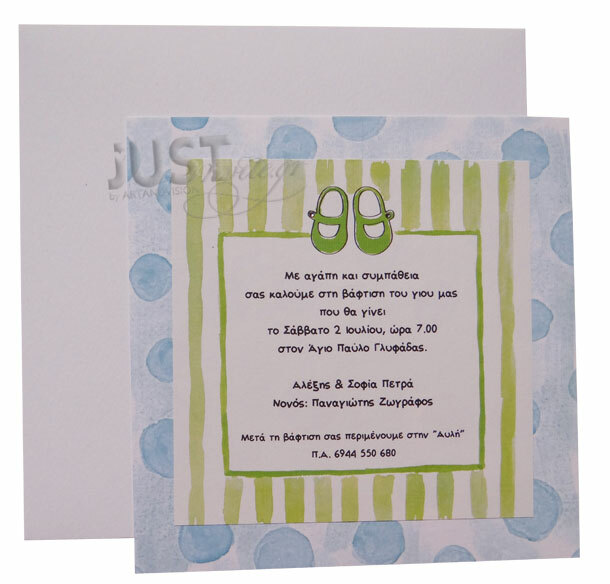 Lovely Greek Baptism invitations baby shoes theme, for a boy coming in a card with a baby shoes pattern in baby blue and chartreuse green colour and strass beads attached to it. The matching envelopes are square white paper and your personalized wording is printed in plain grey colour. Size: 17 x 17 cm. Unit price: 1, 33 euro. Printing cost 65 euro total (VAT included). Shipping cost not included. https://www.preciousandpretty.com/2017/04/greek-christening-invitations-baby-shoes-for-boy-C908.html Greek Wedding Favors|Orthodox Crowns|Stefana|Baptism Invitations Greek Christening invitations baby shoes for boy C908 Greek Christening invitations with baby shoes for boy Product #: Greek Wedding Favors|Orthodox Crowns|Stefana|Baptism Invitations_1605682177492022346 5 stars out of 5 reviews.